L-R: Siemens CEO Joe Kaeser and Alstom CEO Henri Poupart-Lafarge pictured in 2017 after the two companies signed a memorandum of understanding to merge. Photo: Siemens. 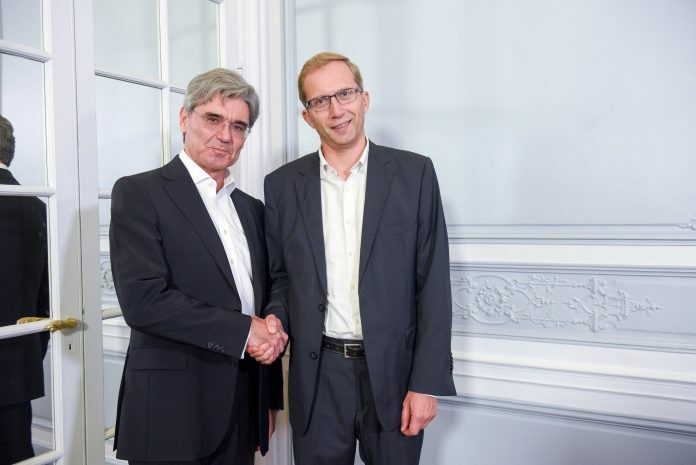 Alstom’s proposed merger with Siemens’ mobility division continues to progress after the two submitted an application to the European Commission for its approval. Nevertheless, following “extended pre-filing preparations and data gathering efforts in multiple countries”, the French firm said that a delay in the deal’s close cannot be ruled out. The transaction had been expected to close at the end of 2018 but as a result of the hold-up, the merger’s completion date could be pushed back into the first half of 2019. A decision from the European Commission is expected by July 13. The deal is also subject to the approval of Alstom’s stakeholders, who are set to meet on July 17, 2018, as well as competition authorities. Recently the two parties proposed the joint company’s board of directors and also entered into a business combination agreement over the conditions surrounding the merger.